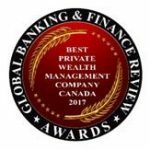 Global Banking & Finance Review Awards Desjardins Private Wealth Management “Best Private Wealth Management Company Canada 2017”for the second consecutive year in recognition of their continued commitment to provide clients with comprehensive wealth management solutions. The awards honour companies that stand out in a particular area of expertise within the banking and finance industry. Desjardins Private Wealth Managementwas selected as the best private wealth management company because of the company’s strong performance and commitment to providing excellence in wealth management.